Throughout my travels in Japan I visited many Shinto shrines. Each Shinto shrine in Japan has a pair of komainu (lion-dog in english) placed either at the entrance of the shrine, or somewhere inside. Symbolically, komainu ward of evil spirits. The two figures are almost identical, except in the case of the mouth: one statue’s mouth is shut while the other’s mouth is open. After doing some research, I found that the mouths are actually pronouncing the first and last letters of the Sanskrit alphabet. The open mouth pronounces an “a” sound, while the closed mouth makes an “um” sound. Together, the komainu chant “aum," a sacred symbol representing the beginning and end of all things. 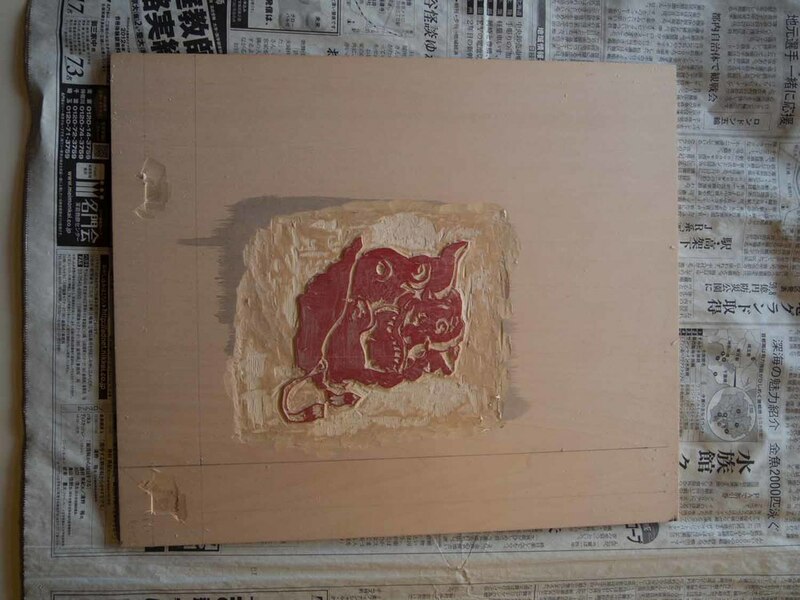 The Komainu depicted in my image is broken from the head down and diaphanous. 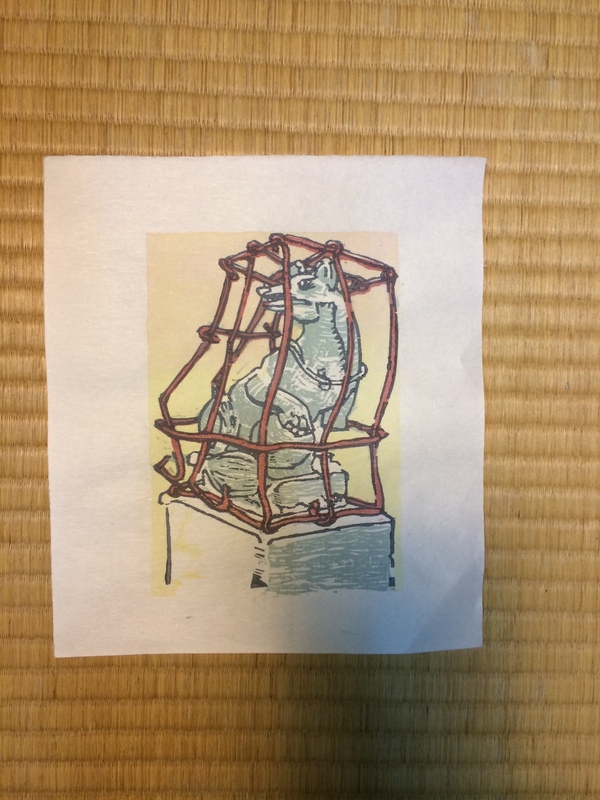 Many of the older shrines in Japan use cages to preserve the komainu statues, as they have weathered and broken over time. Cages can be interpreted in many different ways: protection, preservation, jails or barriers to name a few. 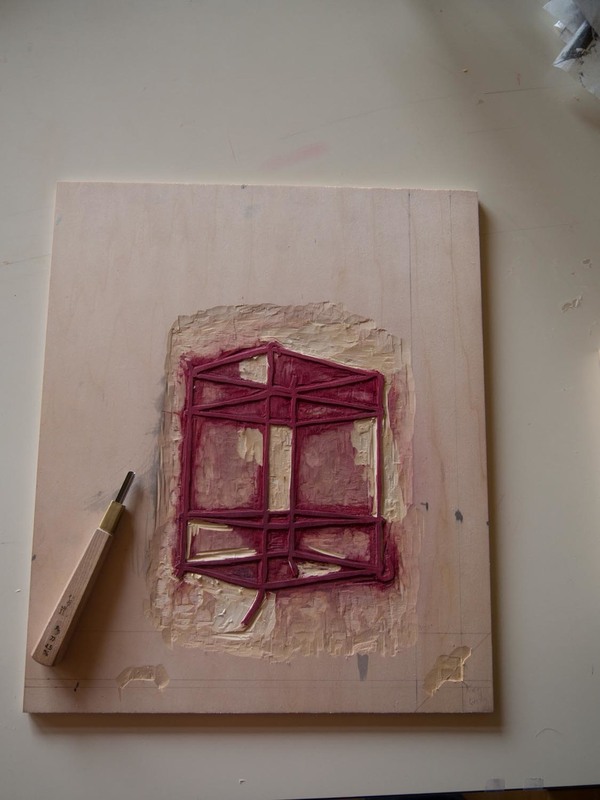 I’m going for preservation in this work, and read the overall meaning of this piece as an attempt to maintain mindfulness of the present moment. I often find myself overly concerned with what is going to happen in the future, or re-thinking situations in the past that might have gone a different way. This work is a reminder that the present moment can quickly fade. Creating an image with both translucent and opaque areas that overlap would prove to be a technical challenge. 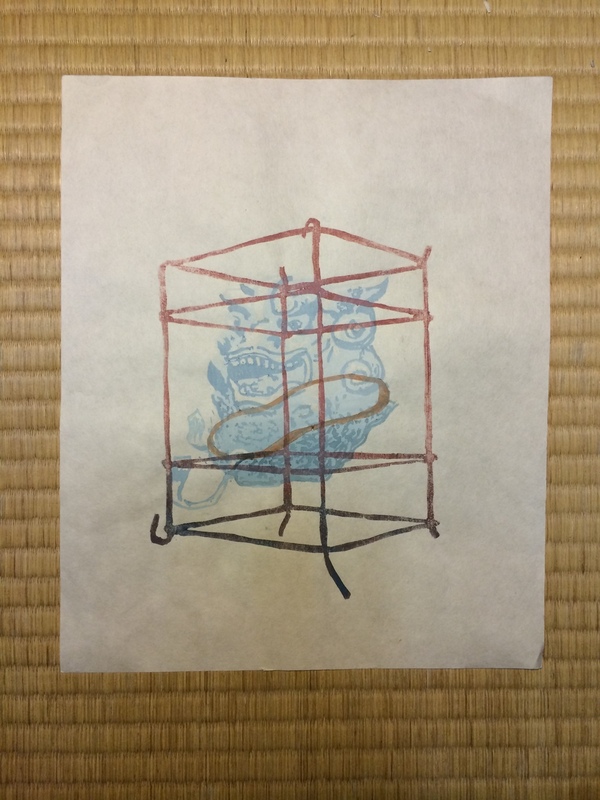 To achieve the numerous effects, I printed with watercolors for the translucent komainu, and with gouache for the opaque rope and cage. To give the cage an aged feel, I added some German antiquated calligraphic ink I picked up when I was in Vienna. 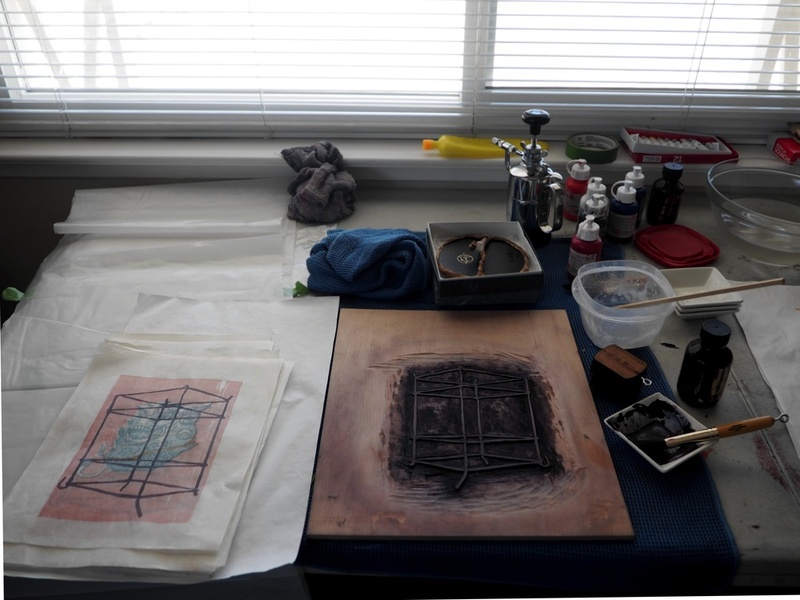 Here are some photographs of the finished piece. 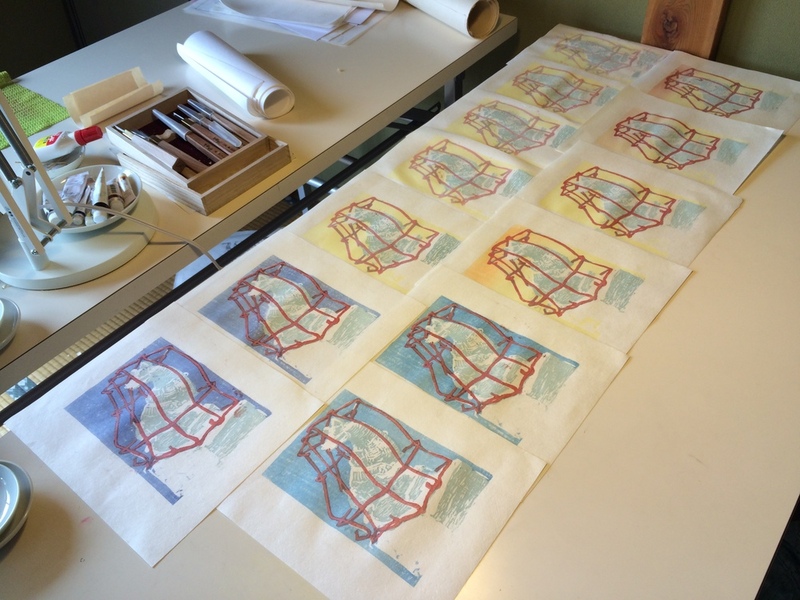 Mokuhanga Prints at the MI-LAB Residency in Japan. 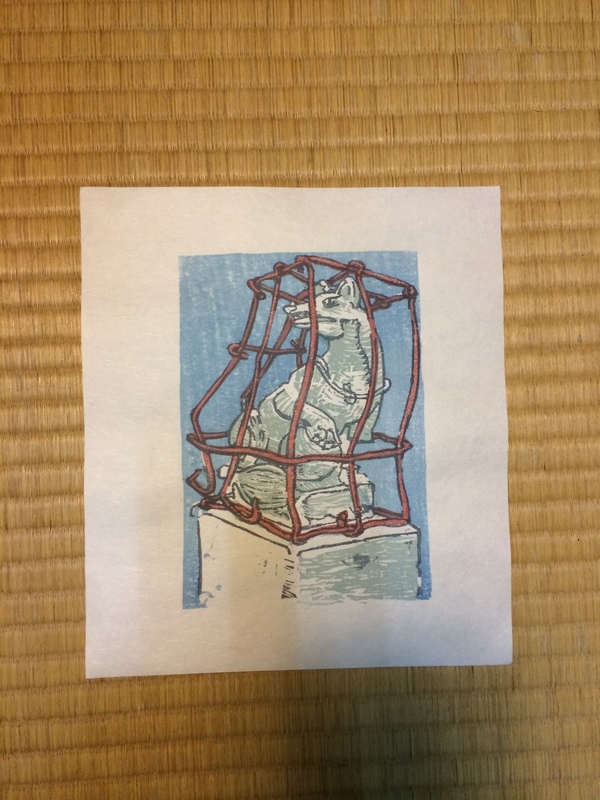 I’ve been at the MI-Lab Residency (Mokuhanga Innovation Laboratory) for three weeks now, studying the process of traditional Japanese mokuhanga printmaking, and it's awesome. 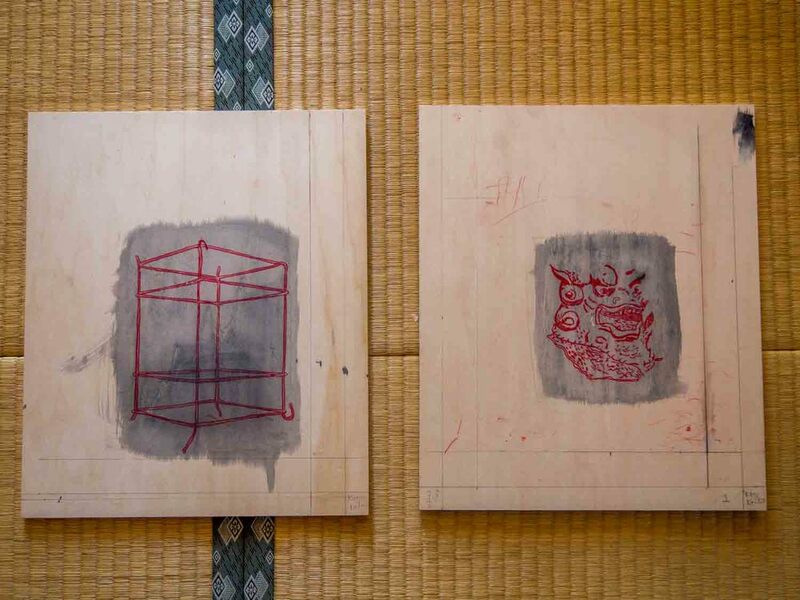 I can't think of a better place to learn woodcut printmaking than in Japan, with a view of Mt. Fuji. 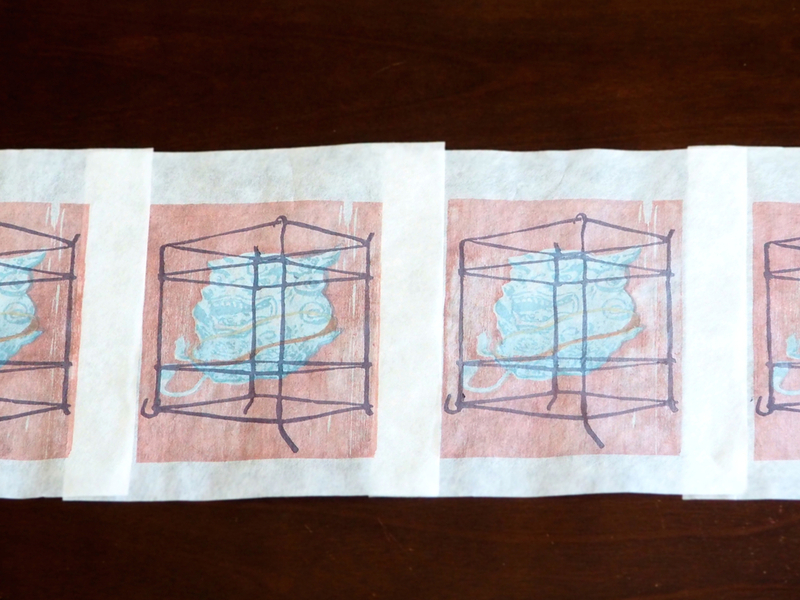 Check the gallery for process shots of two images I'm currently working on.